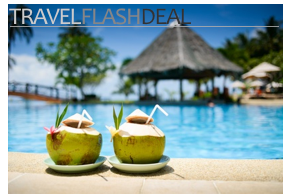 Two huge heated pools provide more than a quarter mile (400 meters) of swimming pleasure. Swim the whole length of it and you’ll pass six waterfalls and a dolphin habitat. The pool is open year round except for maintenance during one winter month (usually December). The Tropicana might have the 6th best pool on our list, but this longstanding resort on the southern end of the Strip has the highest pool-excellence-to-room-rate-ratio of any in Vegas. There are several large pools here, some connected by narrow swimming channels. One of the pools is heated to 90 degrees F (32 C) and is open year round; another is half indoors and half out. 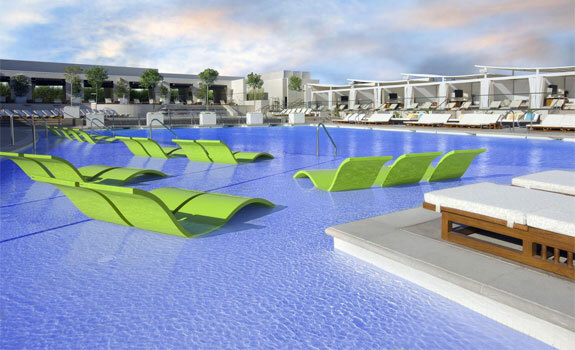 The coolest features, however, are the summertime swim-up bar and swim-up blackjack areas. 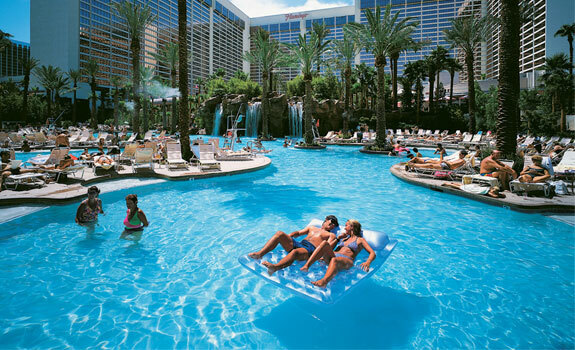 The pool at the Golden Nugget, in the Downtown area, falls to #5 because it is not very large. 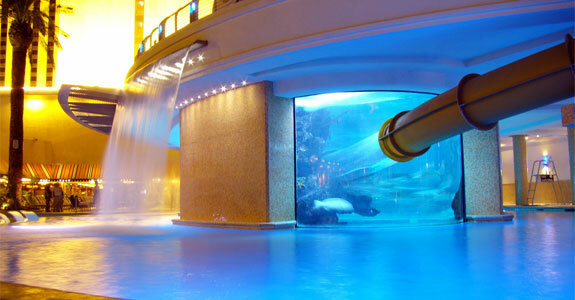 However, it does have perhaps the coolest feature of any Vegas pool: a shark tank! No, the sharks aren’t in the pool with you. But it does sort of feel that way. 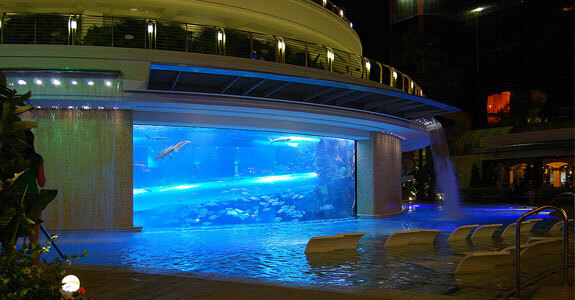 A 20,000-gallon aquarium, home to five species of sharks as well as multiple fish, sits square in the middle of the Golden Nugget’s oval-shaped swimming pool. And if you want to get even closer to the sharks there’s a 3-story high water slide that runs straight through their habitat. Check out the YouTube video below, taken by some one we hope had a waterproof digital camcorder. This is where the beautiful, young, scantily clad folks tend hang out, especially during the Sunday Rehab parties. If you manage to pry your eyes from the people you’ll see that the Hard Rock’s pool complex is rather beautiful too. There are several little sandy beach areas, a meandering river pool and lots of lush little hidden away spots grabbing some alone time with one of the pool patrons. 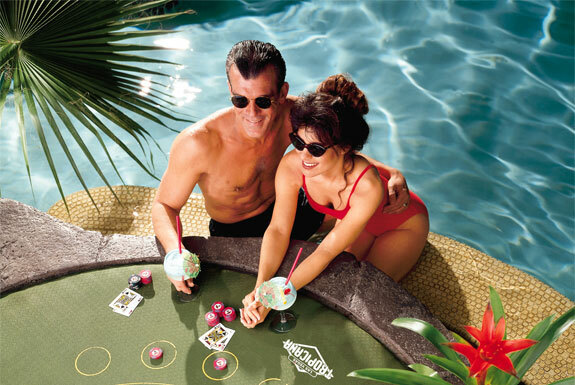 We also like the swim-up blackjack table. 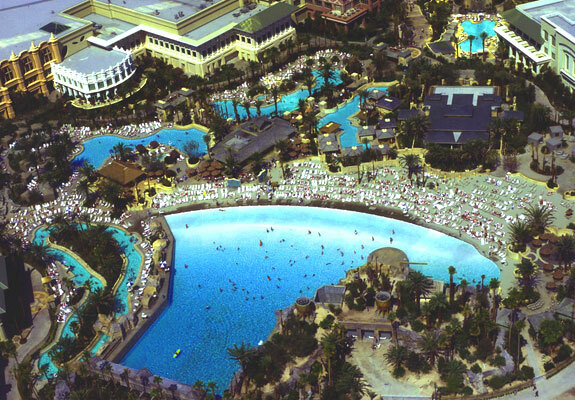 The Hard Rock pool is open to non-guests. 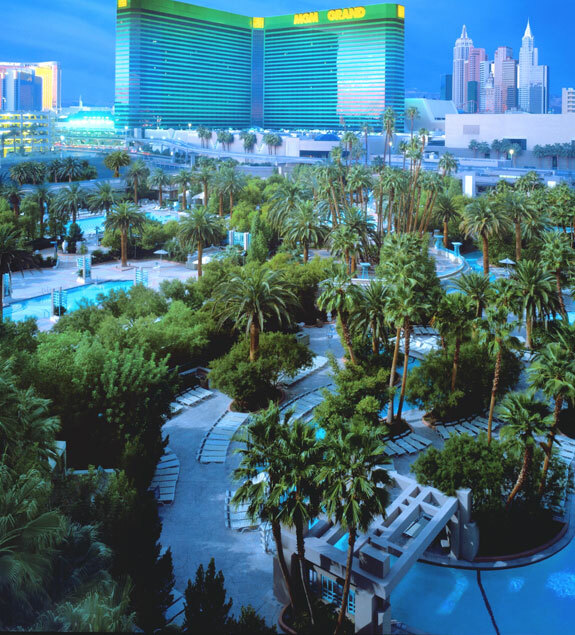 The MGM is a phenomenally huge resort and has a pool to match. 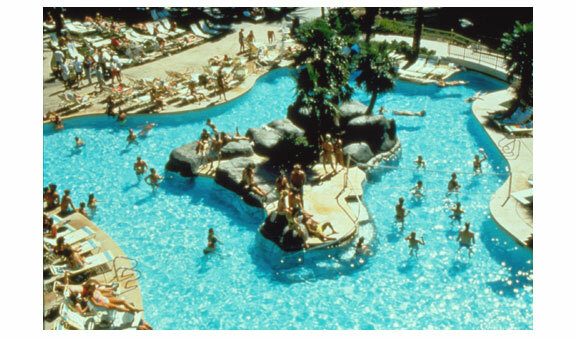 Over nearly 7 acres of tropical settings the MGM plays host to three whirlpools and five large swimming pools. At our favorite of the pools there’s an extended very shallow area (eg. a few inches/centimeter’s deep) with low set lounge chairs—perfect for kicking back with a book. There’s also a “river” that meanders around the pool. Rent an inflatable inner tube and let the river current take you along. A 150-foot water slide that spills out into a series of terraced pools. 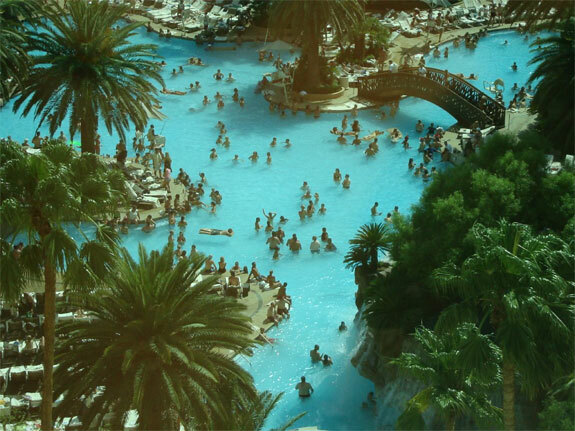 An 80-foot (24-meter) long year-round heated pool fronted by a pink flamingo fountain. Gorgeous landscaping. Numerous waterfalls. Swim-up blackjack. 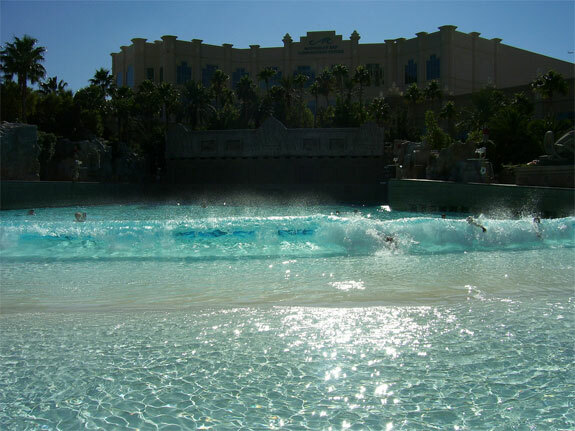 The enormous 15-acre pool complex at the Flamingo has nearly everything swimming-related except for a sandy beach and wave pool (like Mandalay Bay, below). There so much here that you can find an area that’s social or secluded or kid-friendly or whatever pool-side scene fits your mood. You’ll get your ID inspected more intently at the entrance to the Mandalay Bay pool complex than you will at the entrance to the secure area of the airport. That’s how great the swimming pools are here. Everyone in Vegas wants to go. But, sorry, you have to be a registered guest either at Mandalay Bay or at their neighboring creatively-capitalized boutique property, THEhotel. The heart of the Mandalay’s pool complex is The Beach. It is an actual beach with sand and lapping waves. The sand, all 1,700 tons of it, was imported from California. The waves are machine-made; they average around 2 feet (60 cm) high but occasionally top 6 feet! The Beach is also the scene of a usually-incredible outdoor concert series (check the schedule and buy your tickets here). Got a gambling problem? You can gaze out upon the action on The Beach through the floor-to-ceiling windows of the air conditioned beach-side casino. The swimming possibilities at Mandalay Bay extent beyond the wave pools too, including one heated pool that stays open all winter and one pool where no kids are allowed. 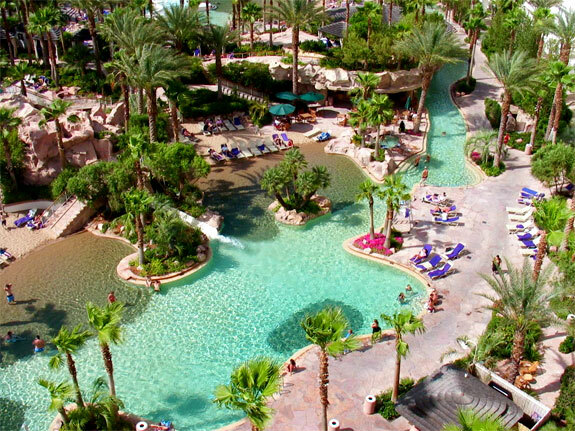 Add to that several waterfalls and a lazy river and the pool alone will make you happy you choose to stay at the fabulous Mandalay Bay Resort. Just make sure you bring your ID. Monte Carlo is an especially good pool resort for families; the swimming complex here includes a 520-square-foot kiddie pool. There’s also a wave pool. 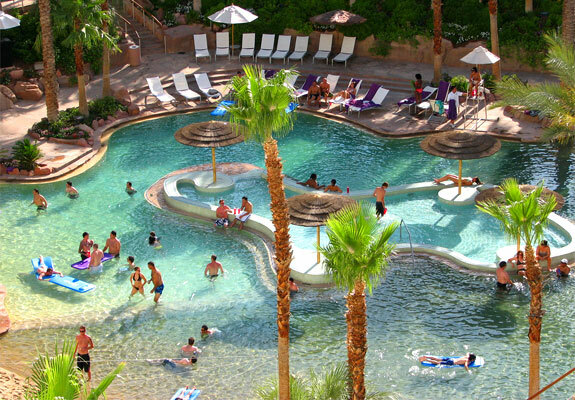 Green Valley Ranch Resort and Spa has a pool with a beach and plenty of surrounding foliage. The Green Valley is several miles from the Strip, though. Wynn is perfect if you are looking for a quiet pool-side place to hang out. The long, thin pool here is the sort of place where you’ll find most people napping on your lounge chairs and a few swimmers in the water doing laps. 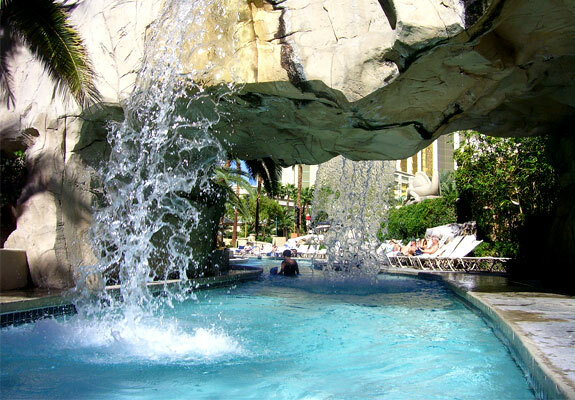 The Bellagio is a great choice if you want to stay in a classy resort on the Strip without a mega pool. The six swimming pools here are are small scale and low key in a faux-Italian garden setting. Wow they all look so amazing! I think the Golden Nugget might be my pick though. 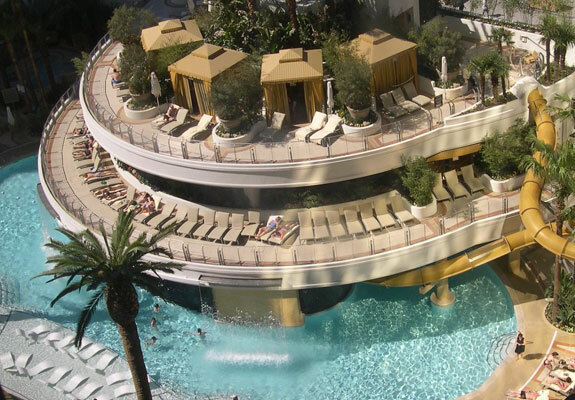 I can’t believe I haven’t visited any of these pools on my trips to Vegas. Next time for sure!! My favorite is the Flamingo and then Mandalay Bay. I live here and have been and seen all. It’s really frustrating that you don’t mention that ALL of these are closed between Dec & April…kind of defeats the purpose of looking at these for a winter break. 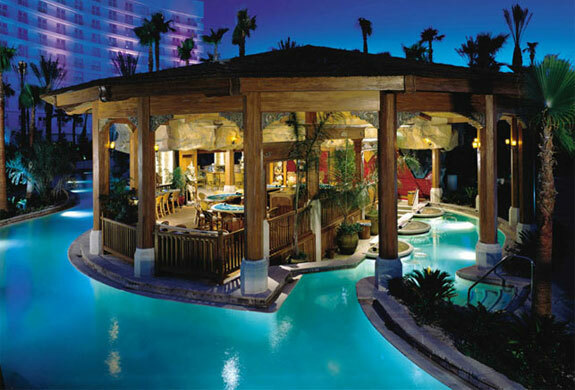 Pool at the Golden Nugget sounds really amazing– what’s the hotel like? 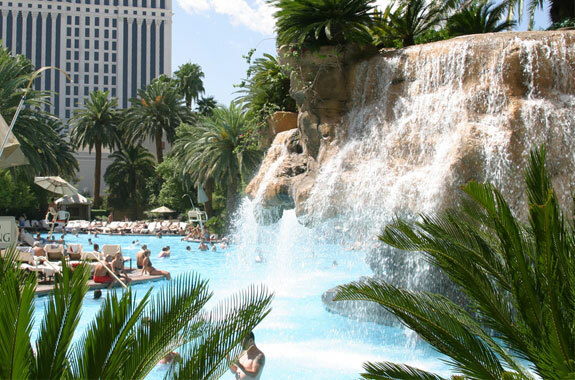 Had the same question about Caesars Palace– cool pools, but are the sheets scratchy? Anybody stayed in either of these? The rooms at Caesars range from okay to great. The sheets aren’t scratchy (at least not that we remember) but the cheapest rooms are a bit uninspiring. It is worth spending the extra $ to upgrade a room level or two. As for the Golden Nugget, the rooms are fine and the beds, we’d say, are “good enough.” It’s definitely more of place to stay when you plan to be out in Vegas (or down by the pool) for most of the time and are using the room almost exclusively for sleeping and showering. Yes, we had the time of our lives at Caesars. also. We stayed in Octavia Tower. Been to four of these top seven mentioned. 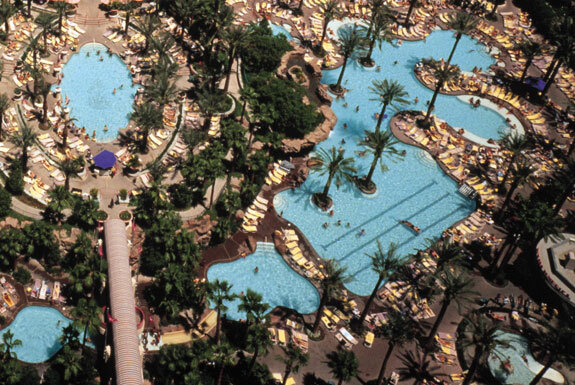 Tropicana was a little older crowd, Flamingo was a mix and cool with it’s various little mini slides, Mandalay incredible, and the slide at the Nugget nicknamed the “Snake Charmer” was addicting! Can’t wait to revisit that one again this summer!! Curtis: All that pretty much sums up our experience as well. Clearly, this summer you should hit the three on this list you haven’t been to. For as many times as I have been to Vegas, I had never heard of the shark tank adjacent to the swimming pool at the Golden Nugget. That would be fun swimming in. I have done the Mandalay wave pool.. those were good times! Nice shoots of beautiful pools i like Golden Nugget pools thanks for sharing buddy.